In November 2017, findings from the first national survey on unaccompanied youth, showed that one in 10 young adults ages 18-25, and at least one in 30 adolescents ages 13-17, experience some form of homelessness over the course of a year. 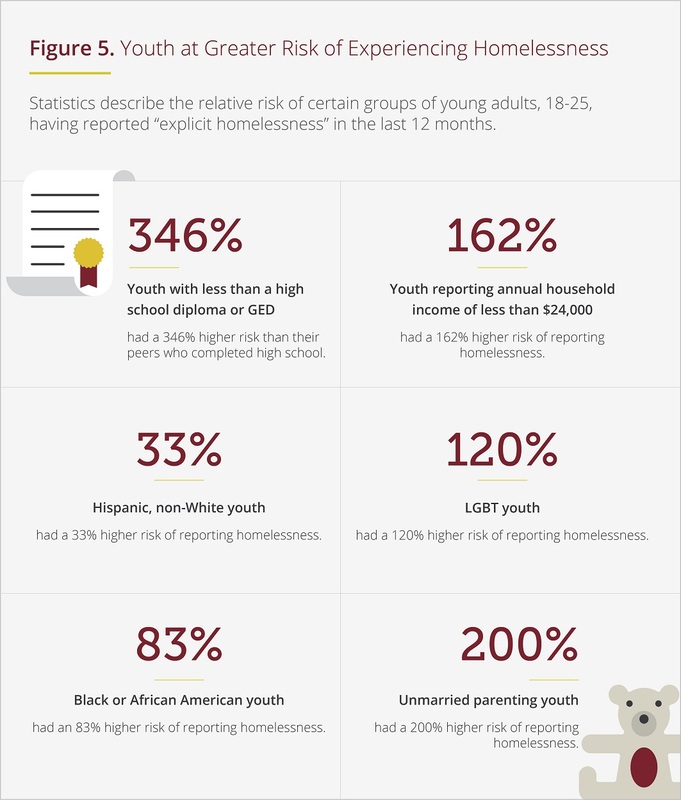 The results, from Chapin Hall’s Voices of Youth Count Initiative (VoYC), reinforce familiar points for providers working to end youth homelessness. But the data adds critical authority and context, helps frame the conversation on youth homelessness with community members and policy makers who may be new to the issue, and supports communication of a shared message. These findings are powerful supplementary tools in our policy toolbox. The most powerful finding in the VoYC data, however, is not the number of young people experiencing homelessness, but rather which young people are at greatest risk of experiencing homelessness. When we understand who experiences homelessness, we are led beyond the question of what scale of response is needed to end youth homelessness. We need to also consider whether our programs and systems are designed to work best for the young people most impacted. VoYC findings powerfully reinforce what we’ve been talking about from the inception of our movement: that to prevent and end youth homelessness for ALL young people, our strategies must be inclusive of and effective for the most vulnerable young people. Among racial and ethnic groups, African-American youth were especially overrepresented, with an 83% higher risk of having experienced homelessness than other races. This disproportionality mirrors black youth racial disparities documented in school suspensions, incarceration and foster care placement. Latino/a/x youth were found at higher risk of experiencing homelessness than non-Latino/a/x youth. Further, while Latino/a/x youth were 33% of the 18-25 year-olds reporting homelessness, only 19% of youth served by federally funded runaway and homeless youth programs in 2014 were Latino/a/x. LGBT youth had a 120% higher risk of experiencing homelessness than youth who identified as heterosexual and cisgender. Future briefings from VoYC, and the forthcoming Phase I National Report from the Center for Social Innovation’s SPARC (Supporting Partnerships for Anti-Racist Communities) initiative, will dig deeper into these intersecting risk factors: exploring how African-American, Latino/a and lesbian, gay, bisexual, transgender and/or queer (LGBTQ) young people not only experience homelessness at higher rates than their peers, but that their risk is uniquely concentrated because of their race, sexual orientation, or gender identity, and the systemic inequities at play. What might this mean for us as a movement? It is now clearer than ever that we cannot solve youth homelessness nationwide unless we can solve it for the most vulnerable young people. And in many communities across the country that means designing, implementing, and scaling up our strategies to meet the needs of young people of color and LGBTQ youth. How might we get there? A Way Home America has been inspired and challenged by examples of industries centering people on the margins—like in the case of universal design. Take, for example, the sidewalk curb cut. Curb ramps are installed on city sidewalks so that an individual using a wheelchair can better access the opportunities available in a community. But then so can a parent with a stroller. Or an elderly person using a walker. When people who are the most marginalized are at the center of our design, everyone benefits. What does it mean to center young people of color and LGBTQ youth? It means solving problems from their perspective, and considering them first in every potential solution. We need to move beyond asking whether a strategy will serve everyone to focusing first on whether it will effectively address the needs of those most likely to be in need. To do that, we must use all of the data we have available to look squarely at who is at greatest risk of experiencing homelessness in our communities and making sure that our current responses are centering on those people. Using data like VoYC, and with young people as collaborators and colleagues in the work, we will show it is possible to #endyouthhomelessness.